Not much of a paper chase for Microsoft's chairman, who uses a range of digital tools to do business. Bill Gates, chairman and chief software architect, Microsoft, U.S.A.
NEW YORK (FORTUNE) - It's pretty incredible to look back 30 years to when Microsoft (Research) was starting and realize how work has been transformed. We're finally getting close to what I call the digital workstyle. If you look at this office, there isn't much paper in it. On my desk I have three screens, synchronized to form a single desktop. I can drag items from one screen to the next. Once you have that large display area, you'll never go back, because it has a direct impact on productivity. 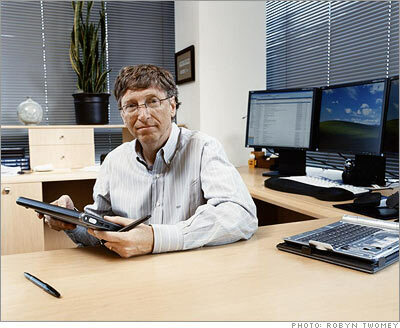 In the digital age, Microsoft chair Bill Gates uses a lot of electricity, but not as much paper. I get about 100 e-mails a day. We apply filtering to keep it to that level�e-mail comes straight to me from anyone I've ever corresponded with, anyone from Microsoft, Intel, HP, and all the other partner companies, and anyone I know. And I always see a write-up from my assistant of any other e-mail, from companies that aren't on my permission list or individuals I don't know. That way I know what people are praising us for, what they are complaining about, and what they are asking. Outlook also has a little notification box that comes up in the lower right whenever a new e-mail comes in. We call it the toast. I'm very disciplined about ignoring that unless I see that it's a high-priority topic. I deal with this by using SharePoint, a tool that creates websites for collaboration on specific projects. These sites contain plans, schedules, discussion boards, and other information, and they can be created by just about anyone in the company with a couple of clicks. Right now, I'm getting ready for Think Week. In May, I'll go off for a week and read 100 or more papers from Microsoft employees that examine issues related to the company and the future of technology. I've been doing this for over 12 years. It used to be an all-paper process in which I was the only one doing the reading and commenting. Today the whole process is digital and open to the entire company. I'm now far more efficient in picking the right papers to read, and I can add electronic comments that everyone sees in real time. Microsoft has more than 50,000 people, so when I'm thinking, "Hey, what's the future of the online payment system?" or "What's a great way to keep track of your memories of your kid?" or any neat new thing, I write it down. Then people can see it and say, "No, you're wrong" or "Did you know about this work being done at such-and-such a place?" SharePoint puts me in touch with lots of people deep in the organization. It's like having a super-website that lets many people edit and discuss�far more than the standard practice of sending e-mails with enclosures. And it notifies you if anything comes up in an area you're interested in. Instead of having to navigate through folders to find that one document where I think a piece of information might be, I simply type search terms into a toolbar and all the e-mails and documents that contain that information are at my fingertips. The same goes for phone numbers and email addresses. The one low-tech piece of equipment still in my office is my whiteboard. I always have nice color pens, and it's great for brainstorming when I'm with other people, and even sometimes by myself. The whiteboards in some Microsoft offices have the ability to capture an image and send it up to the computer, almost like a huge Tablet PC. I don't have that right now, but probably I'll get a digital whiteboard in the next year. Today, if there's something up there that's brilliant, I just get out my pen and my Tablet PC and recreate it. Days are often filled with meetings. It's a nice luxury to get some time to go write up my thoughts or follow up on meetings during the day. But sometimes that doesn't happen. So then it's great after the kids go to bed to be able to just sit at home and go through whatever e-mail I didn't get to. If the entire week is very busy, it's the weekend when I'll send the long, thoughtful pieces of e-mail. When people come in Monday morning, they'll see that I've been quite busy� they'll have a lot of e-mail.